I spent the last two days at a memoir writing seminar led by the author Ilana Blumberg. I haven’t attended many such activities, so I can’t compare, but this one was excellent. It covered many topics, let the participants participate and included writing exercises. Sharing our hastily written pieces showed up the similarities and differences in our lives. It came as no surprise to me, in a seminar held in Israel and conducted in English, that all the participants had moved to Israel from other, mostly English-speaking, countries. None of us was forced to leave our native countries and for all but one the move was intended to be permanent. But, as I listened to the tale of one woman who’d moved with her husband, ten children and twenty-four suitcases, I realised how different the emigration/immigration process can be. I came on my own with one case. I hopped on a plane and landed less than five hours later to join a year-long programme. My stay in Israel could be temporary or permanent. I didn’t have to decide at that point. That’s not to say that my immigration process was all plain sailing. But I didn’t have the difficulties of arriving with a large family. The seminar has made me think again about memoir. I did write one once, but when I reached the end, I decided I needed to start again and change the structure of it. I thought of a new way of organising it, began again and stopped. How could I be sure that way was any better? Maybe the best way, in the end, is to write it chronologically, because that shows the sequence of events and the affect each event had in shaping the personality of the author… me. The seminar included a discussion of what Vivian Gornick in “The Situation and the Story” calls… well… the situation and the story. The situation is what happened. It shows the events – the descriptions, the conversations, the actions. The story is the emotional journey caused by the situation. The story is what we need to tell, but it’s not clear what the story is. This is something the writer has to work out. Without a story, the memoir is a jumble of events. The story tells the author which events to tell and how to tell them. It tells the author how to create order from chaos. I suppose that’s why I don’t have a structure. I haven’t yet worked out what my story is. 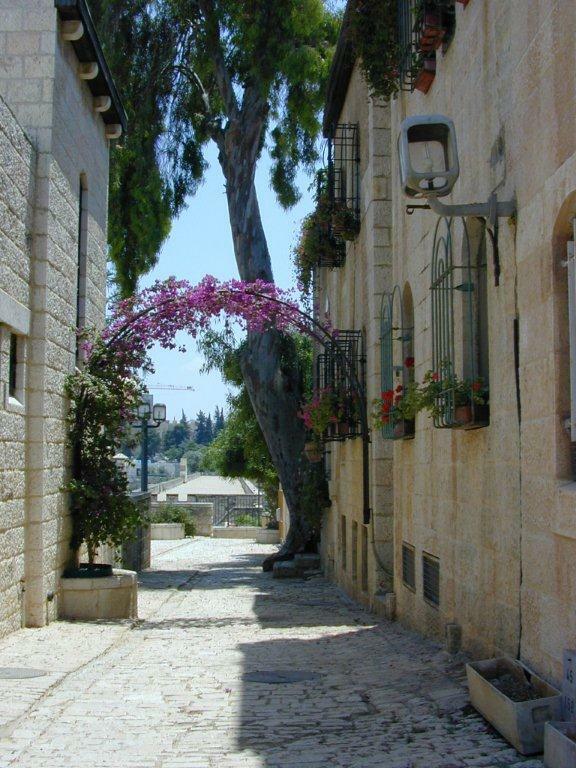 The seminar was held in the picturesque neighbourhood of Yemin Moshe. It’s a neighbourhood of alleys and cobblestones. Of several stairways leading down to the Old City of Jerusalem. The view is magnificent. Arriving early, as I often do, I decided to take a short walk around the area. My feet led me to the house we lived in for about fourteen years until we moved out seven years ago, and I realised how much I miss this place. I remember how lovely it was to be able to step from the house into this area of history and beauty, away from the noises and smells of modern day life, yet within easy walking distance of the town centre and the Old City. I’ve never missed a home before. Certainly not the one I grew up in. I was eager to leave the place with memories that were mostly sad. In one of my writing exercises in the seminar, which I read out loud, someone noted that, when writing about visiting my former house and school, I’d mentioned looking at both from the outside. That does reflect how I feel now about my former life. I’m outside it now and pleased to be so. Wow…. what a story in itself. I would LOVE to attend a writing seminar outside the States. Thanks for sharing. The seminar sounds fascinating. It’s interesting to notice how we hold our memories depending on what emotions they raise in us… I for one, would love to read your story when you publish it! Thanks, Rachael. I have a reader! The writing seminar, and the way you write about it, makes interesting and powerful reading. I would certainly love to hear more of your story and will be first in the queue for your memoir if you decide to write and publish it.